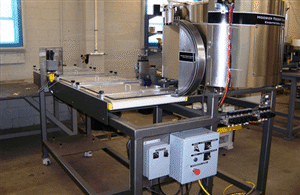 The basis for any great inspection feeder is high-speed output and tooling to accommodate the widest variety of parts possible. Common parts that we feed into an inspection process include styles of nuts, bolts, bushings, threaded components, and washers. Vibratory feeders give us a great opportunity to feed metal parts of varying sizes and styles while still being capable of high output rates. In order to provide an inspection process with a cost-efficient (e.g. high-speed) feeder, we look for durable and regularly shaped parts that will allow for swift orientating. The bullet industry also requires a very large quantity of precise parts to be visually inspected, for which we have a solution. The Hoosier Feeder Company Bullet Feeder is a variant of our heavy duty centrifugal feeder and was developed to sustain heavy use and output an extremely high number of cartridges per minute, all the while being flexible enough to feed several calibers. The bullet feeder operates off of the long cylindrical shape of the bullets, meaning parts with similar qualities could be fed at extremely high rates for inspection as well. Hoosier Feeder Company is no stranger to part inspecting processes, so if you have any questions about your next project don’t hesitate to give us a call!